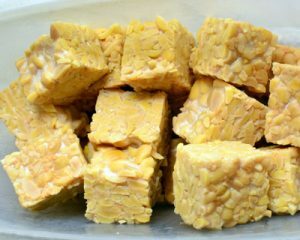 Try our new delicious recipe with cubed chunks of tempeh flavoured with all sorts of goodness (like garlic, miso, ginger, maple syrup and of course, Sriracha!). (Optional) Steam or poach for 2-3 minutes. Remove from water and set aside. Heat 2-3 tbsps of oil in a wok. When the oil is hot, add tempeh. Stir-fry, gently stirring occasionally, till tempeh is golden-brown. 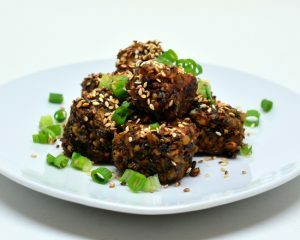 While the tempeh is frying, blend together all other ingredients except the sesame seeds in a food processor till you have a thick paste (it can be chunky!). Add paste to the wok. 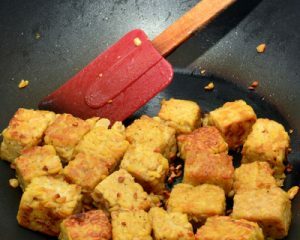 Stir to coat the tempeh cubes, and cook for a few minutes. Garnish with sesame seeds and minced green onion.